Why Do Dogs Snore? How to Stop a Dog From Snoring? Does your dog snore so loudly that you can’t sleep in the same room with him? If your answer to this question is in the affirmative then you must feel relieved to know that you are not alone and there are ways to handle this situation. Many new dog owners are forced to sleep on couch because they can’t stand the loud sound of their furry buddy’s snoring from the corner of their room. They also don’t want to ban their beloved dogs from sleeping in their bedroom and frankly speaking, this is not the proper solution to our ‘big’ problem either. Let’s face the fact, like people, most dogs snore when they sleep. Most of us don’t pay much attention to our dog’s snoring because it’s common in dogs or we have probably gotten used to hearing them snore that we don’t even notice it anymore. However, if your dog is snoring then it could be a sign of a wide range of health related problems than just annoyance. Sometimes it can become serious and lead to many fatal diseases. As soon as you notice your dog’s snore, it’s a good idea to at least check in with your veterinarian. Dogs snore for many different reasons. Contrary of popular belief, dogs do not snore just to annoy their owners. Like humans, dogs simply snore because of obesity or some blockage in their airway. Some dogs snore when they sleep in specific position while some are born to snore. Snoring in dogs can be caused by infection, environment and other medical issues. If your dog just started snoring while sleeping then you should change his position or roll him over, that will make him stop the snoring. However, if your dog is a lifelong snorer, as certain breeds have a greater tendency to snore, then there is very little you can do to stop the snoring. Watch this video to understand the severity of dog snoring. Here are the most common causes for your dog’s snore. According to FDA, an estimated 54% of dogs in USA are overweight or obese. Obesity is the most common cause of snoring in dogs because the extra weight collapses the nasal passages of dog’s throat and blocks the airway which leads to snoring as he needs to breathe harder. If your pup recently gained some extra pounds then this could be the main cause of his snoring problem. Sleeping position of a dog also plays an important role in snoring. 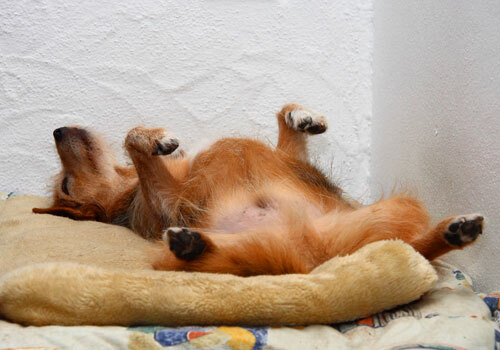 Dogs that sleep on their backs are most likely to snore than dogs sleeping on their stomach or curled up. To identify the snoring caused by sleeping position, you should change your dog’s position when he snore and curl him up or roll him over. If that makes him stop the snoring then it’s safe to say that wrong sleeping position was the cause of snoring in your dog. Sometimes dogs snore because they have blockage in their nose or throat caused by a small physical object. Whether it is a blade of grass or stick or a small toy or piece of cloth, if some object has struck in your dog’s nose or throat then it can block the airway and can cause snoring. Certain dog breeds, that have short nose or are pug faced, have natural tendency to snoring. 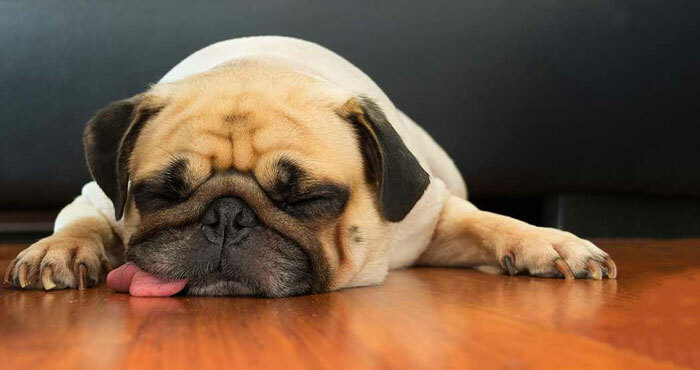 Dog breeds, such as Pug, Bulldog, Shih Tzu, Boston Terrier, Pekinese, Boxer, and Shar Pei have shorter air passages than most dogs and have to work harder to breathe so they are more likely to have breathing or snoring issues as night. 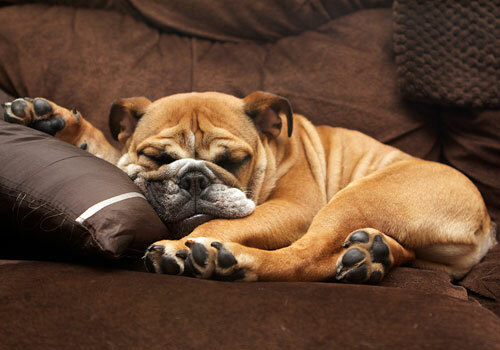 With these breeds, you can’t do much to stop them snoring. But it is important to check with your veterinarian to make sure that snoring is normal and not an indication or some health related problem. Like human, dogs can get cold and that can lead to stuffy noses. Dogs can have temporary inflammation in their nasal membranes from allergies, infections and fungus. That can cause nasal discharge, sneezing and snoring in dogs. To stop the discharge and snoring due to rhinitis, your dog will require medical attention. Fungal disease like Aspergillosis can cause snoring in some dogs. This type of medical condition in dogs is normally triggered by mold found in the air and the environment, often picked up on grass clippings, straw, hay or dust particles. 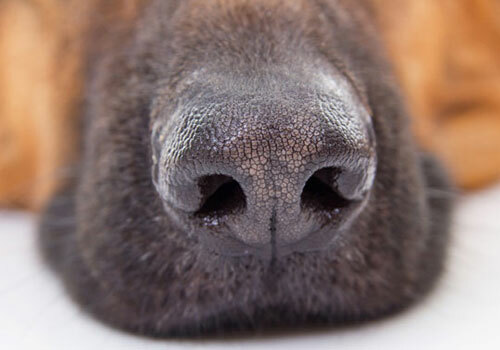 This can cause nasal discharge, sneezing and snoring in dogs. So it’s very important for your dog’s health to treat those fungal diseases else they can lead to many serious medical problems. Dental problems, such as an abscessed or bad tooth or any unnatural growth in dog’s mouth can lead to serious infections which can cause snoring in dogs. In some cases a bad tooth can penetrate through the root of a dog’s mouth and reach to nasal passages. Once found, this should be treated immediately. If remain untreated, this will not only cause your dog to snore but also can lead to many serious medical issues and kidney related problems. 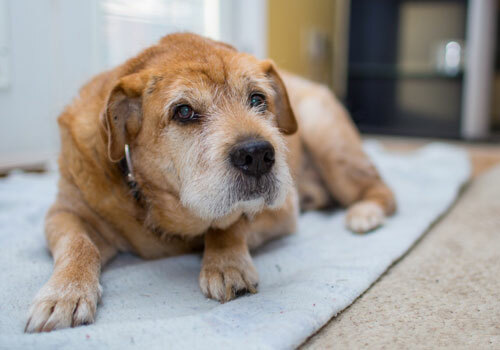 Dog’s age is also important factor in snoring as older dogs are more prone to snore than young ones. 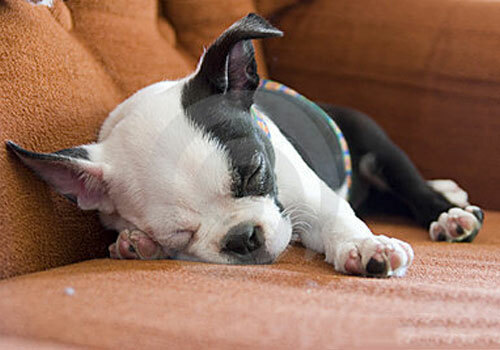 Puppies almost never snore but as they become adults, they are more likely to snore while sleeping. Although you can’t do much to stop snoring in dogs caused by age but it’s a good idea to check with veterinarian to confirm, snoring is caused by your pup’s age and not some health related problem that require medical attention. Often ignored by most dog owners but passive smoking is another reason to cause snoring in dogs and other animals. Passive smoking closes the air passages in dog’s throat and damages the dog’s respiratory system. It can lead to asthma, snoring and other breathing problems. Sleep on round bed – Let your dog sleep on a round bed that will force him to curl up or sleep on his stomach instead of sleeping on his back. Most dogs snore when they sleep on their backs with their paws up in the air. Balanced diet and exercise – Obesity is one of the main cause of snoring in dogs. To lose extra weight, you should feed your dog a nutritionally balanced diet based on a dietary plan and introduce proper exercise into his daily schedule. Physically fit dogs are less likely to snore in their sleep. Prevent passive smoking – Quitting smoking is not only beneficial for your own health but also your family’s health. If you can’t quit, prevent smoking inside the house and near your dog or other pets. Regular vet checkups – Snoring can be caused by many health related problems and diseases. That’s why regular veterinary checkups are important for your dog’s health to avoid any long-term health problems and not only with snoring specifically. Snoring in dogs can be related to so many different causes and it should be evaluated by a veterinarian for proper treatment, if the cause is a medical condition. Ignoring or tolerating your dog’s snore is not in the best interest of your dog’s health as it can reduce the lifespan of your dog and affect his quality of life.